Young open water stars took to the water in allocated age groups. The Championships are the country’s flagship open water age group event attracting the future stars of open water swimming. There were 27 swimmers in the girl’s 14 year old category. Adel’s Silver Medal finishing time was 18:15.10, her personal bestand a full 2 minutes faster than her qualifying time at the South East Regional Open Water race in May 2017 when she also finished second in her age group. Adel has been a member of Chesham Swimming Club since she was 7 years old. 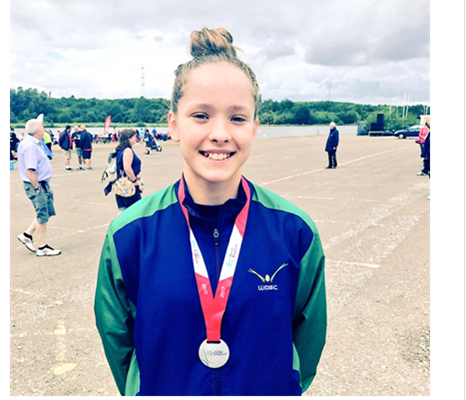 In September 2016 she moved to Wycombe District Swimming Club where she is part of their Intermediate Performance squad which entails over 14 hours of training each week. Her love for open water swimming started as a fun challenge in 2016 and has taken her to a podium position in the 2017 National Swimming Open Water Championships. We are very proud to be supporting Adel and look forward to promoting her further achievements.